I’m spending these next few days in Washington, DC with my amazing CCHCC co-workers. 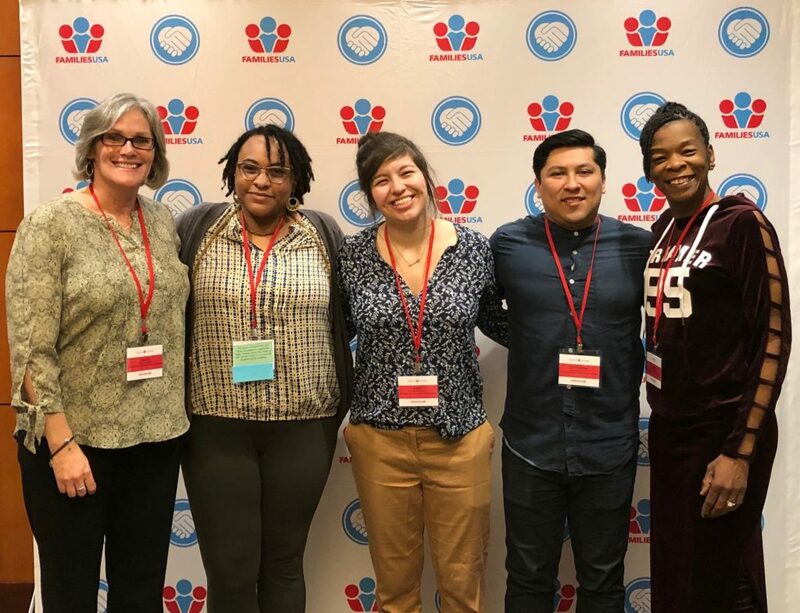 Adani Sanchez, Chris Garcia, Paulette Colemon-Peeples, Ashley Buckley, and I are attending the annual Health Action conference put on by Families USA. Although getting to DC is not easy for us (like I said, we do it on the cheap! ), we are going out of our way to attend this conference so that we can better serve our community and strengthen our advocacy work. Although the trip is grueling (especially the older I get! ), the reason we try to come to this Families USA Health Action conference every year is so that we can gain the tools and knowledge we need to better serve our community and to strengthen our advocacy for health care justice. There are many workshops for us to attend – we are always trying to learn as much as we can! Adani Sanchez is focusing on workshops on Outreach and Enrollment and Patient Navigation, and Fighting Back Against Health Reform Sabotage, and the Health and Well-Being of Immigrant Children and Families. Paulette Colemon-Peeples will attend workshops on Prescription Drug Coverage and Medicare. Chris Garcia will attend workshops on 1115 Medicaid Waivers, Prescription Drug Reform, and Substance Use Disorders Crisis, and Health Equity. Ashley Buckley will attend workshops on Using Data Disaggregation to Drive Health Equity; and Using Evidence Based Data to Advance Health Equity. And I will attend workshops on Improving Oral Health, Foundations and Health Philanthropy, and closed-session meetings with Congressional Office Staffers who can give us an inside view of health policy discussions in Congress. The conference, and what we can learn here, is especially important this year. The Trump administration has been doing so much to sabotage health care – Medicare, Medicaid, and the Affordable Care Act – that we have to employ all tools and strategies necessary to protect and strengthen health policies and laws, at the national and the state level. We also need to strengthen the nation-wide network of health advocacy and health care justice organizations and our ability to coordinate on a sustained basis. As always, I want to thank you for your support and involvement. The last couple of years have shown us in dramatic fashion how important it is for people at the grassroots to be engaged and active in fighting against bad health care policies and laws, and in fighting for health care justice. We at CCHCC are doing all we can to better serve our community and to deploy the knowledge, skills and tools needed to strengthen our advocacy and organizing efforts.